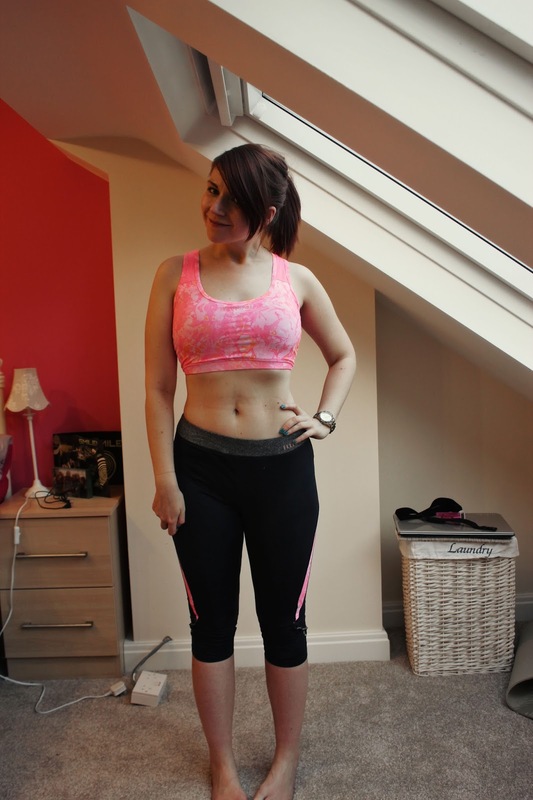 Recently, buying fitness clothes and accessories has become much more of an addiction than buying normal clothes. As I've only been seriously into fitness for about a year and a half, there are always new things to buy, and I love having a variety of tops to match to my different bottoms (shorts, capris, full length leggings...), and there are always new gloves and water bottles and dumbells to buy. Unfortunately, not only did I spend £70 in Sports Direct the day before I realised my foot was properly injured, I also received this cool fitness gear from F&F and Elle Sports at the same time. I received a sports bra, leggings and a "performance jacket." Now I had never even heard of a performance jacket before receiving it, but it's basically a very lightweight jacket which I think would be perfect for running in the winter or to wear while waiting for a race. I've been wearing it a lot around the house before and after my workouts. In terms of workouts with my foot injury, I've had to keep it gentle. I started out by following the Blogilates beginner's workout calendar and I did 30 minutes of pilates every morning before work. Anything that looked like it would be too much on my foot (mostly the cardio workout) I swapped for another video. 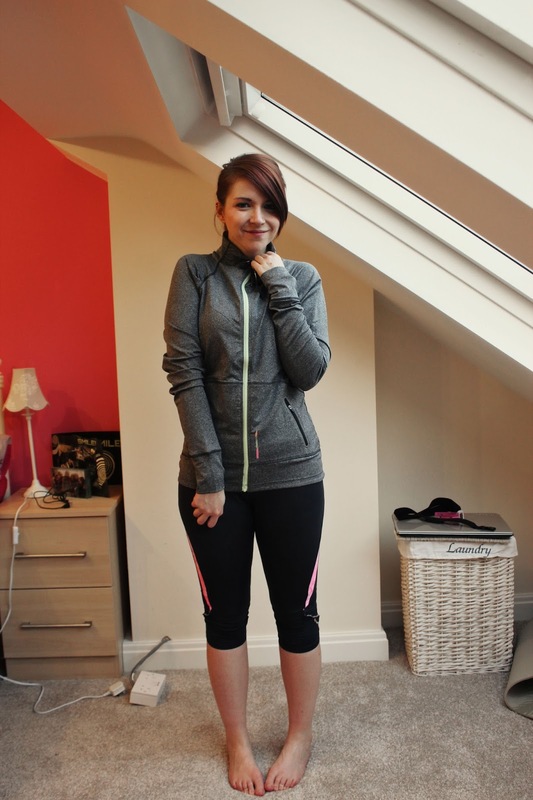 I also wore this combination of bra, leggings and jacket throughout those workouts and the stretchy material was perfect for all the stretching of pilates. Obviously I haven't been running, but I'm not sure if these leggings and bra would cope with something more intense- the leggings don't have a draw string and sometimes fall down, and I don't think the bra would handle Insanity or running, but everything is perfect for pilates. Also yesterday I started Chalean Extreme and so far I absolutely love it. It gets my heart rate up to the same level as Insanity (however, not as frequently), and I love strength workouts. I'm currently doing it just with the weights I have (1.5kg and 3kg), but I've ordered two more sets of dumbells- a pair of 4kgs and a pair of 6kgs. I might get more when I need to, but right now, even with those I am sore. Tomorrow is the Stockport 10K which was my first 10K ever last year. It really upsets me that I won't be running it-especially after receiving my race number last week, but I'll just have to wait til next year. My foot is getting better but it's still not 100% but I'm hoping that focusing on Chalean Extreme for a few weeks will distract me a bit and get me back into a routine so I don't start running on my foot straight away as soon as it feels better! Along with the lovely fitness clothing I was sent, I have also been sent a selection of fitness arm bands so you can listen to music while you go without having to worry about holding your phone or MP3 player! I have 10 to giveaway, so all you need to do is comment on this post and let me know you're email address, and the first 10 people to comment will get one of this armbands! Sorry but this is only open to UK residents. I'll be back tomorrow with photos from my first week of my 30 for 30. 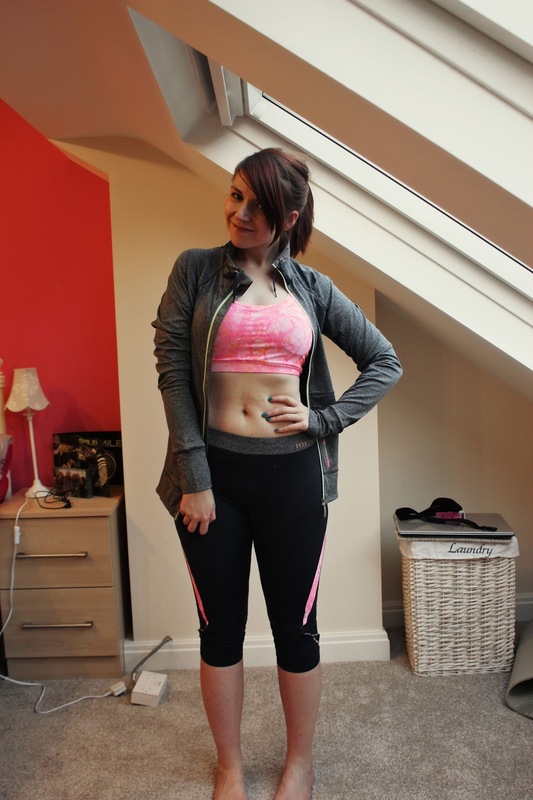 I got a load of exercise wear too before I went and sprained my ankles, so have barely had a chance to try them yet! But meeee for the arm band please! I just shove my phone down the old sports bra, and there's barely enough room in there as there is! AHH exercise shopping is SO HARD! I love this though, wish I could show off my stomach! But hey thats why Im going to the gym! Great post. Your so inspiring! Don't worry about the 10k you're still ahead of those people not trying! I love those leggings, may need to get some to wear for yoga! Would love to win one of these as I've just got back into running again. I'd love to win an arm band as I broke mine the other day! Oops! That sports bra is so pretty! Working out in pretty clothes is much more fun! And I'm totally with you, it's addictive!